India has a rich heritage and a diversified culture, which also results in the rise of various classical dance forms which are well known and well appreciated by people from all over the world. Read about the classical dance forms of India that foreign tourists may not want to miss. India has a diversified culture and this gives rise to various classical dance forms. These dance forms are the result of India's rich heritage and additionally, each dance form represents different regions of India. Each and every dance form must be around 1000 years old or maybe more. Though India has modernised, still these classical dance forms hold a strong position when it comes to Indian culture and popularity. In fact, many of these classical dance forms are renowned and appreciated in every corner of the world. If you are visiting India, contact the local tour operators or discuss with the official state tourism development authorities and they will be happy to arrange some of these dance programs for you. 1.Bharatnatyam: Bharatnatyam is one of the oldest and most popular classical dance forms of India. It hails from the southern state of Tamilnadu. The word 'Bharatnatyam' can be ideally split up in between to find its exact meaning, viz. Bhav + Rasa + Taal + Natyam. The roots of Bharatnatyam link back to the 'Natraj' posture of Lord Shiva. This dance form mainly relates to tales of Lord Shiva, Krishna and Lord Vishnu. The various items in Bharatnatyam consist of Alaripu, Tilana, Javeli and Jatiswar Padam. 2.Kathak: Kathak is a dance form that hails from Uttar Pradesh. It is said that the name of this dance form actually originated when people used to dance and enact kathas or stories. It was only during the Mughal rule, that this dance form became more popular, as it was performed in courts. The three main pillars of Kathak are balance, pose and control. Ghungroos became one of the vital parts of Kathak. Kathak always begins with Ganesh Vandana. Few of the famous Kathak performers are Pandit Birju Maharaj, Uma Sharma etc. 3.Odissi – Odissi is one of the most important classical dance forms of India. This dance form hails from the State of Orissa, in eastern India. This dance style particularly makes the sculpture of the Sun temple at Konark get life and come alive. It is a lyrical classical dance which has been traditionally performed by young girls in temples. These young girls are known as Maharis who dedicate their lives to the deity of the temple. Slowly and steadily these dance form was also performed by young boys, called Gotipra as a mark of devotion. This was how the Odissi dance evolved. The dominant theme of this dance form is either devotional or love. The dancers who perform this dance form particularly wear costumes made from rich Orissa silk along with heavy silver jewellery. 4.Manipuri – Manipuri is one such classical dance form hailing from the north east India. Manipuri is one of the graceful dance forms and is said to have evolved from the epics of Puranas. The theme of these dance forms are purely love. The various foundation of this dance form includes the Rasa – lila of Shiv-Parvati; Radha – Krishna; and much more such deities. The important elements of this dance form are the Sankitrtan and the rasa. Theses movements are extremely graceful and are coupled with soft and light steps. Few well-known performers of Manipuri dance form are Zaveri sisters. 5.Kathakali – Kathakali is one of the most magnificent and ostentatious dance forms hailing from the state of Kerala. Kathakali is a dance drama, and the important element of this dance form is the Natya which takes preeminence over the Nritya. This dance form looks majestic, royal and heroic in character. Kathakali is performed in front of a large audience only. The performers of this dance form are usually found with intricately painted faces and loudly dressed. The various themes related to Kathakali are based on mythological stories and epics including Ramayana and Mahabharata. Few of the well known Kathakali performers are Gopi, Madhavan and more. 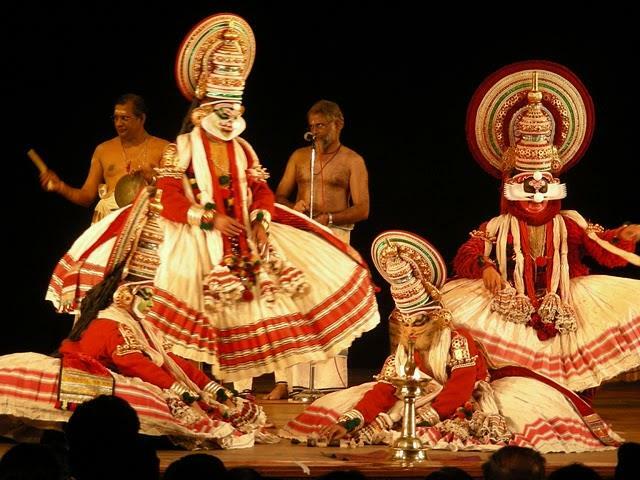 6.Mohiniattam – Mohiniattam is a classical dance form that too hails from the state of Kerala. This dance form is more or less based on the Bharatnatyam dance form. Mohiniattam is basically based one of the Dashavtars of Lord Vishnu, 'Mohini' the temptress who use to lure gods. The theme of this dance form is either devotional or love. Few of the famous Mohiniattam performers are Bharat Shivaji, Shanta Rao etc. 7.Kuchipudi – Kuchipudi hails from the state of Andhra Pradesh and is one of the well-known classical dance forms of India. Kuchipudi is a dance drama which was male dominant earlier. But nowadays Kuchipudi is mainly performed by females who also play the male part. The performer wears heavy ornaments and costumes, and most of the ornaments are made of lightweight wood called the Boorugu. Few well-known performers of Kuchipudi are Dr. Uma Rama Rao, Uma Muralikrishan, and many more.